The Boijmans van Beuningen Collection Building will store the personal collections of museum Boijmans van Beuningen, stichting de Verre Bergen and a number of private art collectors. The building will be erected in the Museumpark in Rotterdam. Part of the Collection Building is open to the public. The private collections are also open to the public a few days a year. The building houses a large atrium. This is the heart of the building, which is round and has six floors. In the open-plan atrium, you will find staircases linking the different floors. From the reception room on the ground floor, this zigzag route goes upwards through the building to the green public roof with exhibition room, restaurant and sculpture garden. The park, rooftop restaurant and sculpture garden are open to the public. From the roof, which is surrounded by a wind barrier, the public has a panoramic view over Rotterdam. In the design of the Boijmans Van Beuningen Collection Building, the shape of the building and its reflective façade are what define the building’s overall appearance and are the calling card for the museum. 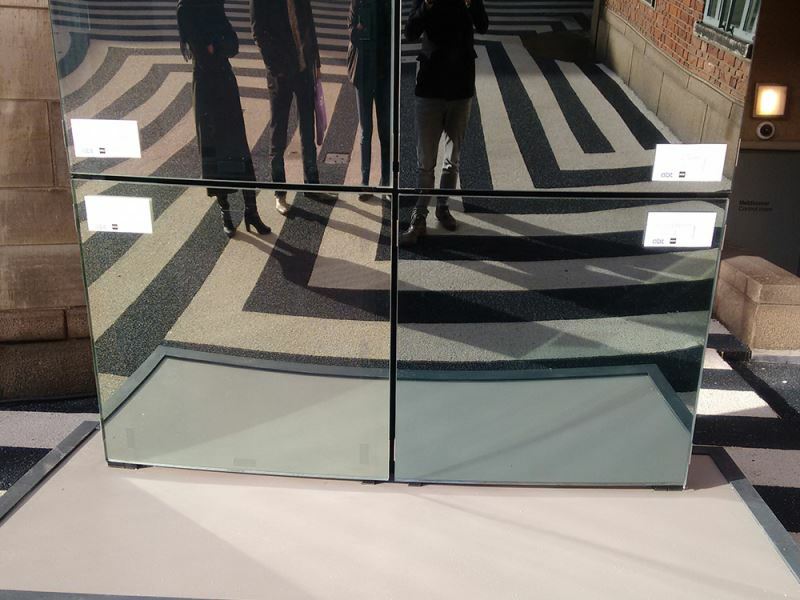 The perception of the reflection’s perfection is affected by the accuracy of the shape. By describing it in mathematical rules – by means of rationalisation – the shape could be determined exactly prior to production. By recognising the curve as a variable, changes in the shape could easily be implemented in late stages of the design, without affecting the current process. 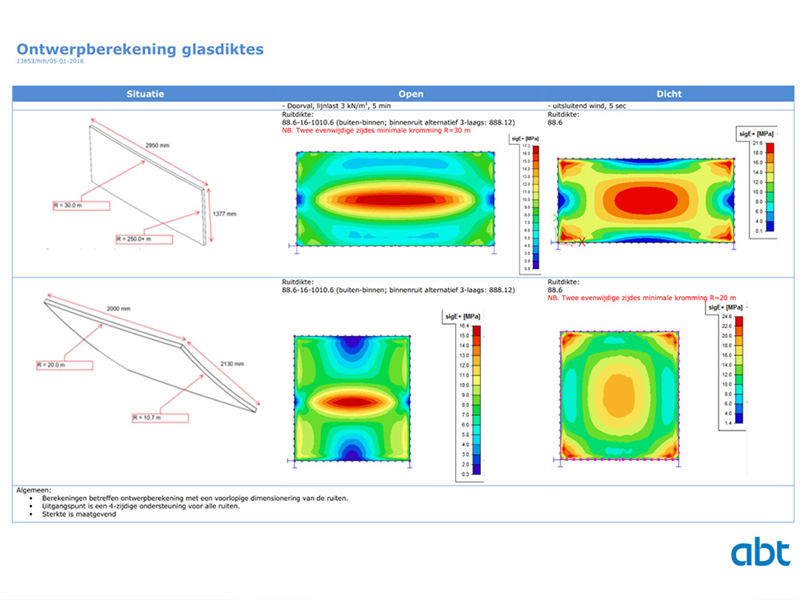 The exact shape of the glass panels has been recorded in BIM models (Revit). 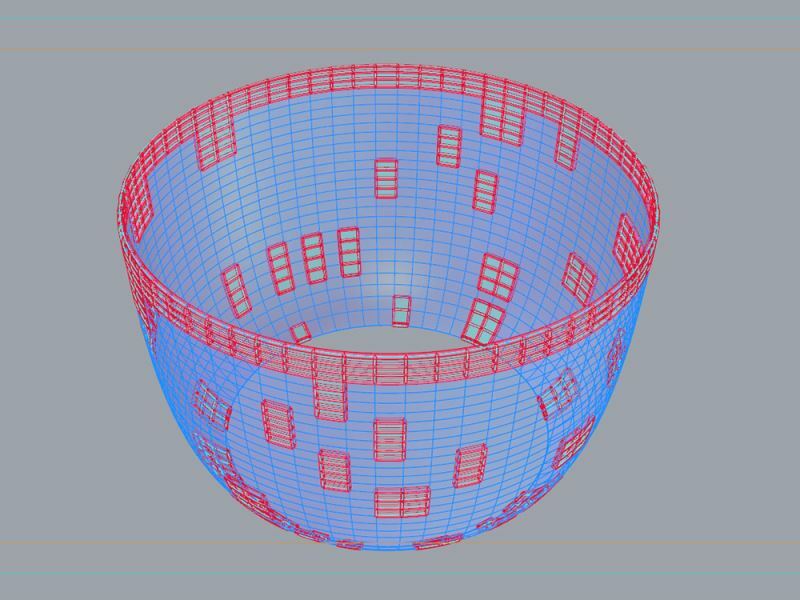 By linking these models to parametric shape models, it was easy to generate new documentation and thereby respond flexibly to changes in shape. ABT BEE has proven that the reflective façade is technically and financially feasible. ABT BEE has also produced the technical design for the glass façade and provided MVRDV with architectural support in developing the building. 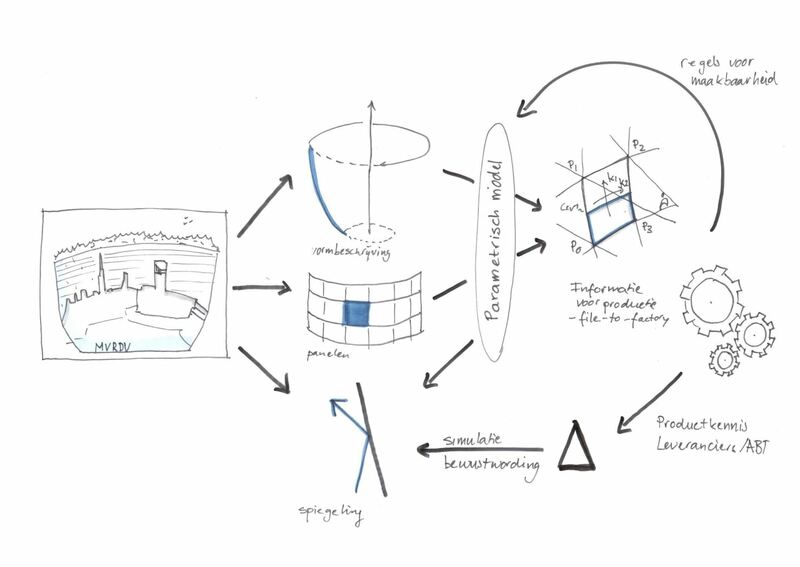 By making use of optimisation models, a model has been produced that can be used to find the optimal technical shape of the façade. The façade consists of 64 segments and 26 rows, which means that the project incorporates 26 unique spherical curved glass panels. A technical masterpiece! Through close contact with façade builders, glass suppliers and glass flexors, it has been tested whether the innovative design is feasible too. Different glass samples have been produced to create a panel with the correct colour of glass and reflection. ABT BEE’s overall advice has brought together the different specialist fields, including costs, building physics, construction, regulations, architectural detailing and feasibility, in a coordinated façade design. It is possible for the contractor to continue working directly with ABT’s models during the implementation phase. ABT has supported MVRDV with the technical design for the inside of the building, stairways, banisters and railings, various technical issues and regulations. Inside the building, ABT has implemented its specific knowledge about fire and burglary prevention for museums. ABT has also written the specification and the H&S plan for MVRDV.